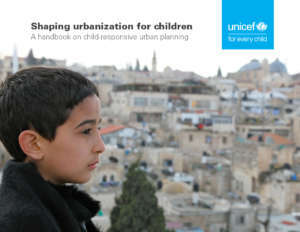 UNICEF’s recently launched publication, ‘Shaping urbanization for Children: A Handbook on child-responsive urban planning,’ seeks to inspire action by setting out the evidence of children’s vulnerability related to the built environment, to raise awareness and promote the key role of urban planning in achieving results. It outlines 5 dimensions of child-responsiveness, to set goals and targets for children that are aligned with other important development agendas. It highlights 10 Children’s Rights and Urban Planning principles that clarify opportunities for urban planning to make cities more child-responsive, in terms of housing, public amenities, public space, transportation, water and sanitation management, food systems, waste management, energy, ICT and data networks.